Useful Color Sets: We provide you kits with selections that we truly believe are all good usable colors. From our extensive color selection you may also customize your kit according to your needs, at no extra charge! You may choose the type and color you prefer. Choose from a variety of covering cremes: oil base, matte finish, water base or liquid. For example, matte finish and water base covering cremes are standard in our kits, you may substitute from our selection of velvet touch liquid covering cremes, our creme velvet oil base covering cremes, our perfection covering cremes, or our standard matte finish water base covering cremes (view color chart). Choose all your colors and customize your kit just the way you want it. Avoid extra cost and unnecessary waste! Carrying Case: Our durable and attractive case is available for our kits, but optional if you do not need another one. Price: With all Derma-Pro Cosmetic Kits you receive a kit price discount over the regular open stock, individual prices. Color Selection: Most kits from our competitors have pre-selected colors and from these you might find only three or four colors you like to use and never touch the rest. Carrying Case: Other companies require you to buy the case, even if you do not need one with every order. Price: If you buy a kit from other companies and do not use three-fourths of the products, the price of the few items you use is high. Derma-Pro Cosmetic Kits are the very best, truly the professional’s choice! 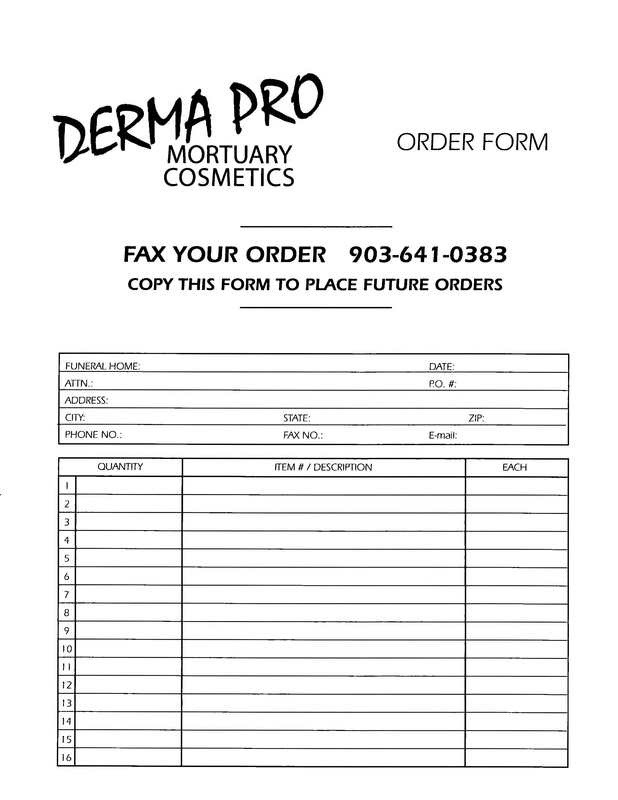 This entry was posted in Derma-Pro Products and tagged 02, mortuary cosmetics, quality. Bookmark the permalink.